The Walnut Hills Boys and Girls Soccer teams and coaching staff will be hosting a FREE soccer clinic on Monday September 29th from 6pm - 7:15pm. All Elementary age players are welcome to attend as the coaching staff and high school age players will be putting on several skill and small sided games. 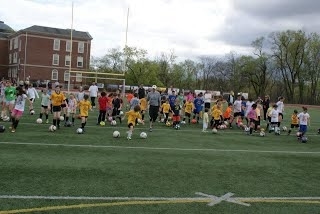 What: Walnut Hills Free Soccer clinic for ages 5-12. What to Bring: Players should bring a ball, shin guards, cleats, water, and wear their favorite jersey. Other important info: Arrive early best parking spots on Sulsar. You can also park by the high school gym and walk around. Also, for those coaches who would like their teams to be together please arrange for your team to meet you around 6pm at the stadium. If you have any questions, please let me know. We hope that you can make it!